Some members of city council, and some candidates for council, have recently made statements misrepresenting the current plan for modern light rail transit (LRT) along Sheppard Avenue East. 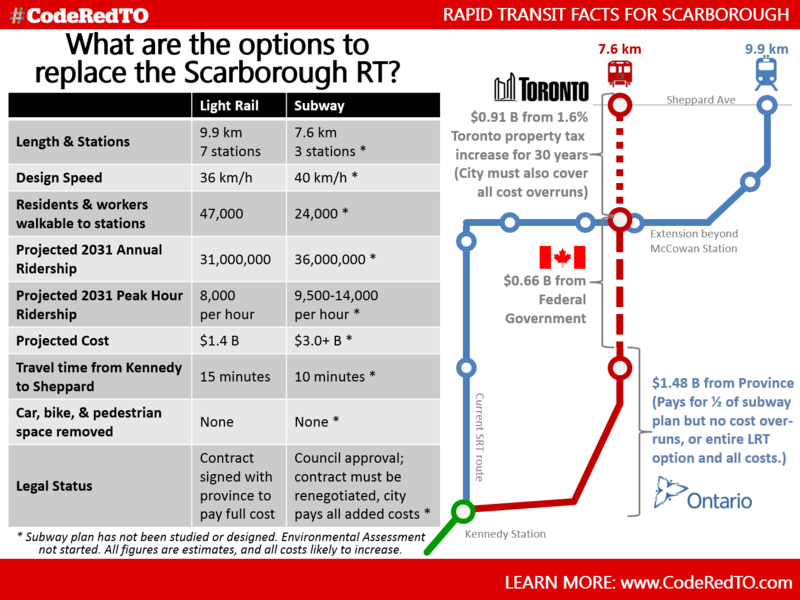 To assist residents, CodeRedTO has assembled the facts, resource links on the plan, and we have calculated how alternate options would look and perform. Learn more about light rail transit by visiting our Resources page! Given the current $1 billion budget committed by the province of Ontario and the government of Canada, less than 3km of subway could be built, as opposed to about 12km of modern light rail transit (LRT). If only 3km of subway were to be built, it would add only one new stop east of Victoria Park, and have just two new stations. The Sheppard East LRT project already has a completed Environmental Assessment, and will be under construction from approximately 2017-2020. Any subway would require at least 2-4 more years before construction could begin, with all planning starting from scratch. The City of Toronto and Metrolinx have a signed legal agreement to deliver this LRT line that includes the province paying for all construction costs. Any change to another mode would require renegotiation and penalties due to contract cancellation with suppliers. The facts clearly show that a subway along Sheppard East would be shorter, would take longer to build, and would serve fewer residents. But more significantly for Scarborough residents, our calculations show that it would save far less time for a rider traveling between Morningside or Malvern and any new subway station near Warden. Buses traveling in mixed traffic along Sheppard East can take 40 minutes to travel this distance (though of course this varies by time of day). While a subway would provide fast travel over 3km of this distance, the transfer time between bus and subway (estimated by Google at 4 minutes on average) means that the average rider’s travel time would drop by as little as five minutes. 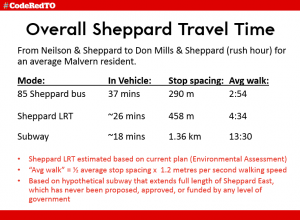 However, the light rail planned for Sheppard East uses reserved rights-of-way so transit vehicles are never stuck behind single-passenger cars, and are able to travel 25-40% faster than the current buses, consistently in all traffic and weather conditions. Our calculations showed that riders could travel from Morningside to Yonge Street in ten minutes less, with a level transfer on the same platform at Don Mills Station. Download our fact-check flyer now, and share with candidates at your door to ensure they have the facts. Find out more by visiting our Resources page! Some members of city council, and some candidates for council, have recently made statements misrepresenting the current plan for modern light rail transit (LRT) along Finch Avenue West. 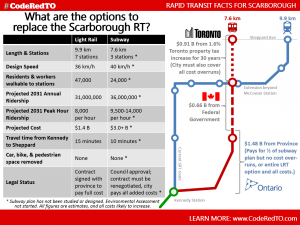 To assist residents, CodeRedTO has assembled the facts, resource links on the plan, and we have calculated how alternate options would look and perform. Given the current $1.2 billion budget committed by the province of Ontario, only about 3km of subway could be built, as opposed to about 10km of modern light rail transit (LRT). If only 3km of subway were to be built, it would not cross highway 400 into Etobicoke at all, and have just two new stations. The Finch West LRT project already has a completed Environmental Assessment, and will be under construction from approximately 2017-2020. Any subway would require at least 2-4 more years before construction could begin, with all planning starting from scratch. 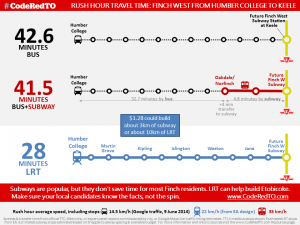 The facts clearly show that a subway along Finch West would be shorter, would take longer to build, and would serve fewer residents. But more significantly for Etobicoke residents, our calculations show that it would save almost no time for a rider traveling between Humber College in western Etobicoke and the new subway station at Finch and Keele. Buses traveling in mixed traffic along Finch West take over 42 minutes to travel this distance (though of course this varies by time of day). While a subway would provide fast travel over 3km of this distance, the transfer time between bus and subway (estimated by Google at 4 minutes on average) means that the average rider’s travel time would drop by only one minute. 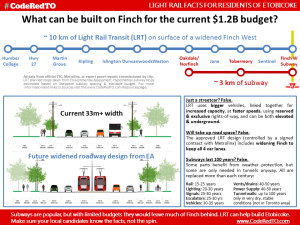 However, the light rail planned for Finch West uses reserved rights-of-way so transit vehicles are never stuck behind single-passenger cars, and are able to travel 50-70% faster than the current buses, consistently in all conditions. Our calculations showed that riders could travel from Humber College to Keele in just 28 minutes with no transfer, a time saving of over 1/3. CodeRedTO does not condone misleading voters and we have evaluated their claims below. Of the SSAC’s over two dozen claims, at least six were false, and at least twelve were either too vague or subjective to evaluate, or were presented in a misleading way. Three alleged benefits of subways over light rail in fact apply equally to both modes. Please contact us with any updates, corrections, or questions at any time. In a website section titled “Why Subway?”, the SSAC lists ten bullet points (shown below in red), with zero supporting context, links, or evidence. Our comments follow each claim. TRAVEL TIME IS REDUCED Correct, underground tunnels do reduce travel time for any vehicle, regardless of technology. This is a major benefit of LRT: it can travel both in tunnels (like under Eglinton and on Sheppard under the 404), and on the surface. Subway trains cannot travel on the surface unless the entire right-of-way is closed off for safety, preventing any other travel options across the route. UNIMPEDED TRAFFIC FLOW PROVIDES GREATER RELIABILITY Correct, underground tunnels do prevent traffic from blocking the vehicle. Since the vast majority of traffic congestion is parallel to the traffic flow, LRT has this benefit for most of its right-of-way as well, since on Sheppard it will travel in an exclusive right-of-way separate from car traffic. This fact is not mentioned at SheppardSubway.com. RAPID, RELIABLE TRANSIT ATTRACTS PEOPLE TO PUBLIC TRANSIT Correct, but has nothing to do with subways. All effective, modern transit modes with reliable travel improve ridership and influence travel decisions. REDUCES GRIDLOCK False: Induced demand shows that traffic congestion cannot be reduced. There is always latent demand which will backfill any improvements. This is a well-studied issue and has been shown time and again in new highway development. The Big Move (which includes LRT, subway, bus, and regional train improvements) has been presented as a way to reduce the growth of congestion, not as a way to reduce it. UNDERGROUND TRANSIT = GREATER SAFETY, FEWER ACCIDENTS Correct. HIGHEST ECONOMIC INDICATORS, CREATION OF MORE JOBS Too vague a claim to evaluate. It is true that improved transit reliability and travel times do improve employment and residential development in various ways. However, a review of the Sheppard Subway shows that employment in that corridor has not grown, only residential, and much of that can be attributed to highway proximity. 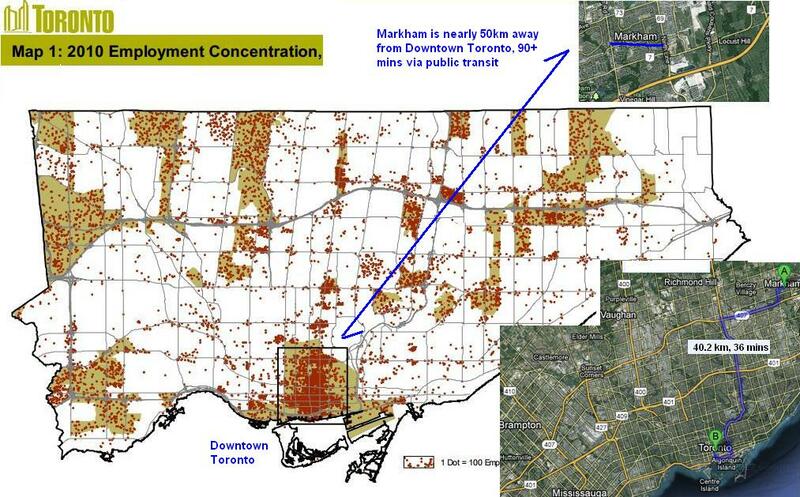 The vast majority of job growth within the GTHA is in the urban cores, not uniformly along subway lines. GREATEST IMPACT ON DEVELOPMENT Too vague a claim to evaluate. Some subway development areas experience rapid change (many condos on Sheppard), while others experience little change (Toronto’s ward 29, Toronto-Danforth, its lowest-density ward and has had subway service since the 1960’s). It should be noted that some SSAC members (incluing a shared executive member / webmaster) appear to be affiliated with a residents’ association currently protesting against development near an existing subway station. PROPERTY VALUES NEAR SUBWAY STATIONS AND LINES RISE Correct, but this is also true of light rail development, as shown in the Journal of Transport and Land Use which studied the Charlotte LRT from 1997-2008, and by the University of North Texas, which found value jumps of about 25% for properties along the Dallas DART LRT line. BETTER FOR ENVIRONMENT, REDUCES GREENHOUSE GASES False: the carbon emissions and greenhouse gases emitted to create an underground tunnel far outweigh those required for surface development, and the carbon emissions required to ventilate, heat and cool, clean, monitor for security, install escalators and elevators, and to maintain underground construction far outweigh that of surface stations. All transit is “better for environment” and “reduces greenhouse gases”, when compared to personal car traffic. HIGHER QUALITY OF LIFE Too vague to evaluate, but one important point is that quality of life must consider not only the car driver who refuses to ever see a transit vehicle, but also the youth or senior traveler who must travel farther to reach a transit station, usually by walking to a bus stop, then riding that bus in traffic jams, just to reach a distance subway station. LRT surface stations on Sheppard will be placed an average of 600-800m apart, while subway stops are typically twice the distance. 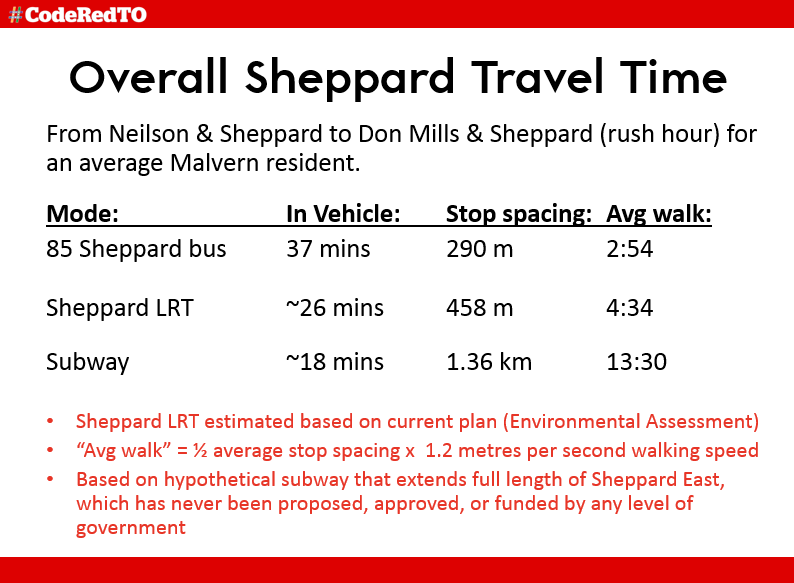 In a second section titled “Why No LRT?”, the SSAC lists eleven bullet points (shown below in red), again with zero supporting context, links, or evidence. 9 INTERSECTIONS IN SHEPPARD CORRIDOR AT CAPACITY IN 2008 This may be true, but no information about where this claim was found is provided. As discussed above, induced demand means this will not change regardless of transit technology (or even additional car lanes) being added. SHARING INTERSECTIONS IMPEDES TRAFFIC FLOW Correct, though this is true of all forms of transportation. INCREASED RATE OF ACCCIDENTS [sic] Without any data, impossible to evaluate this claim. TRAVEL TIME UNRELIABLE (weather, breakdowns, accidents) Exposure to the elements does have impact on surface travel, though LRT performs strongly in all weather types as evidenced by successful LRT systems in extreme-winter environments around the world, including Minneapolis, Calgary, and Edmonton. Breakdowns and accidents can occur, though since the Sheppard East LRT design includes dedicated advance-green signals for all vehicles crossing LRT tracks, this is a misleading claim. Note: Not shown in this chart are the average 4-minute transfer time (per Google Maps) from one mode to another (such as LRT to subway at Don Mills Station), and the average 1-3 minute travel time (estimated by CodeRedTO) to reach an underground platform to board a subway. CENTRE STREET STOPS INCONVENIENT & UNCOMFORTABLE Subjective, but often false: surface stops are more accessible (no broken escalators and elevators as are common underground) and are faster to access (meaning fewer missed vehicles). BENEFITS OF CONTINUOUS TRANSIT LINE LOST Correct. The transfer from subway or bus to LRT at Don Mills Station will be convenient and quick with the LRT and subway vehicles sitting on the same level along the same platform, but the transfer does introduce a short time penalty. PROPERTY VALUES ALONG RIGHT-OF-WAY DECREASE False, as shown in the Journal of Transport and Land Use which studied the Charlotte LRT from 1997-2008, and by the University of North Texas, which found value jumps of about 25% for properties along the Dallas DART LRT line. 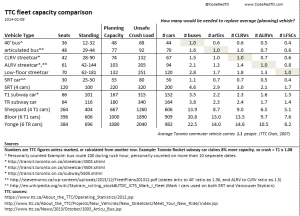 ADVERSE HEALTH RISKS: HIGHER RATES OF CONGESTION AND NOISE False, as discussed above. REDUCES TRAFFIC LANES False. The Sheppard East LRT Environmental Assessment plan shows nearly no changes to the space allocated to mixed traffic. It is required that four car traffic lanes be maintained for the full length of the LRT line, which matches the current road space in all but one section of Sheppard near Consumers Road (where the LRT will enter its tunnel to connect to the existing subway line). 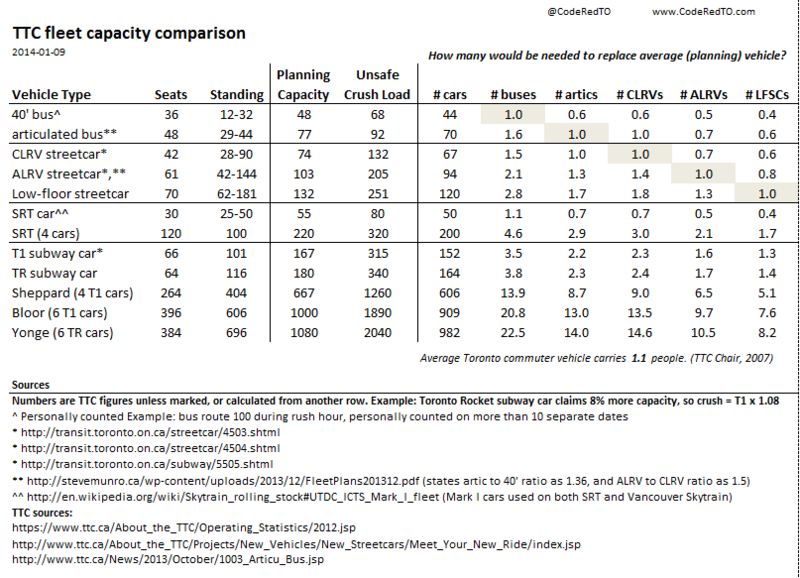 In fact, cars will enjoy increased road space as the frequent Sheppard East buses will disappear from traffic. FOSTERS CAR INFILTRATION INTO STABLE NEIGHBOURHOODS Too vague to evaluate without links or evidence, though we agree car traffic does adapt to changing conditions, just as it does today for the disruptive tunnel construction along Eglinton. Eliminate left-hand turns between major intersections. Correct, just as left-hand turns are not possible along University Avenue (above a subway), along Eglinton Avenue East in Scarborough (no subway or LRT), and along Markham Road near Sheppard East (no subway or LRT). Negative impact on reducing greenhouse gases. False. “Rail transportation produces far fewer greenhouse gas (GHG) emissions than road,” according to the Pembina Institute, but the carbon emissions and greenhouse gases emitted to create an underground tunnel far outweigh those required for surface development, and the carbon emissions required to ventilate, heat and cool, clean, monitor for security, install escalators and elevators, and to maintain underground construction far outweigh that of surface stations. All transit is “better for environment” and “reduces greenhouse gases”, when compared to personal car traffic. Limited economic development potential and uplift. Too vague to evaluate, though according to Cervero and Duncan in the Transportation Research Record, “substantial capitalization benefits were found, on the order of 23% for a typical commercial parcel near a light rail transit stop”. Does not meet City’s Official Plan nor Provincial Growth Plan. Too vague to evaluate. The City of Toronto and the Ontario ministries each update official plans regularly (though sparingly), and both plans indicate support for public transit, for travel options, for improved development, and for increased use of solutions that work in other cities and provinces. Both subway and LRT are mentioned in the December 2010 City of Toronto Official Plan, and both subway and LRT are mentioned in the Places To Grow Act’s Growth Plan for the Greater Golden Horseshoe. The only mention of this key aspect of transit development comes in the phrase “subways necessitate large upfront costs” – note the costs are usually double that of light rail – but there is no comparison of ridership (which would not double), travel time (which would not halve), or construction time (which would be longer by at least 1-2 years at minimum due to the EA and design process). 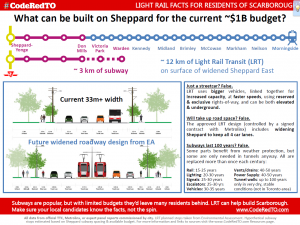 Since Sheppard East provides wide suburban roadways with room for both car lanes and LRT lanes, the same investment can create improved transit speed and options for a far greater portion of Scarborough – roughly double the distance can be built along Sheppard using LRT, at the same cost. 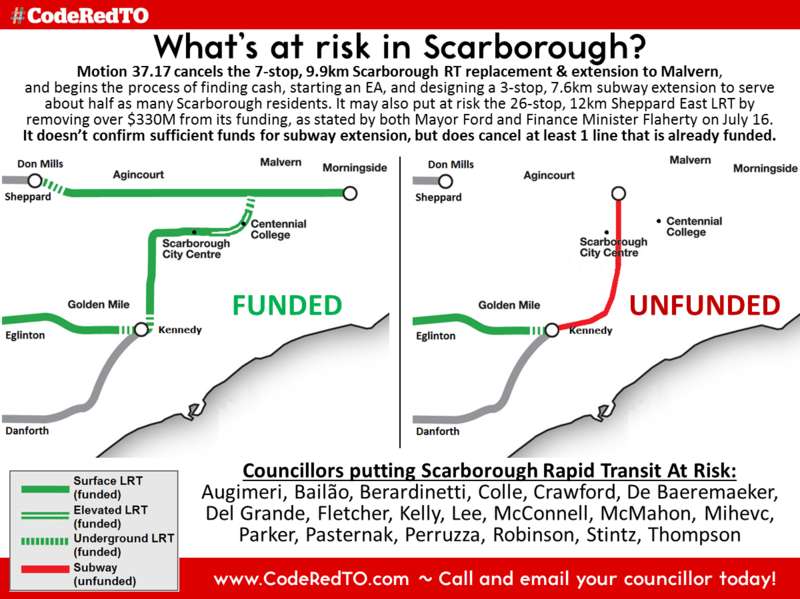 A subway extension would help some riders to be sure, but it would also perhaps irreversibly damage transit improvement for all of Scarborough east of McCowan Road. Subways and light rail are both great solutions for different situations. In the past, Toronto has only built subways, slowly and with great expense, meaning huge sections of our city are left without modern transit. Since light rail is being built and used in over 80 cities worldwide (and more every year), we have an opportunity to improve options for more of our city without incurring greater cost and more delays. 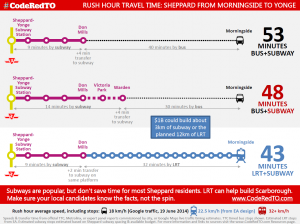 In the case of Sheppard East, CodeRedTO endorses the smart transit option: LRT. CodeRedTO today announced a new infographic today showcasing some of the surprising results of a recent Angus Reid Forum survey it commissioned as part of the Move The GTHA collaborative. The full infographic can be downloaded below, and the survey methodology and results can also be found at Move The GTHA. On April 11, 2014, the Move the GTHA collaborative, which includes CodeRedTO, released a new Angus Reid Forum poll, showing nearly 60% of Greater Toronto and Hamilton Area residents are now more likely to support a political leader who brought in new funding sources for transportation improvements. Support for new revenue sources for transportation infrastructure has increased in the past few months. Posted in media, Q&A | Comments Off on How much would replacing streetcars with buses cost? UPCOMING FREE EVENT: Thurs, Jan 23, 7:00 pm. As part of the City of Toronto’s Feeling Congested campaign, featuring international transit planning expert Jarrett Walker and Toronto’s Chief Planner, Jennifer Keesmaat, in discussion about major transit planning projects around the world. Hosted by Metrolinx and the City of Toronto. LOCATION: St. Paul’s Church, 227 Bloor Street East. Toronto Public Health and the Registered Nurses Association of Ontario have released a position statement highlighting the need for investment in a healthy transportation system to improve public health overall. The health voice is central to the argument for investment, and CodeRedTO is happy to see our umbrella organization, Move The GTHA, connect with these important voices. visit Move The GTHA to learn more!